Linda Kemp's Simplifying Design & Color for Artists is a very accessible tutorial style guide to painting, or more specifically using the negative painting techniques. The first chapter covers mainly composition, identifying and using interesting shapes to anchor the painting. All the chapters have simple and effective tutorials that you can follow to practice the techniques. Step by step screenshots also shot the different permutations possible regarding composition, on why they work or not. Most tutorials are focused on thinking and using negative space, so it's a rather focused book. Chapter 2 is about creating your own colour palette. Picking out colours and arranging them so that they are easier to mix into colours that you want. The theory behind how Linda Kemp picks her colours is quite similar to that from Jan Hart's book Watercolor Artist's Guide to Exceptional Color which is also highly recommended. The next chapter goes on to talk about using colours by hue, value and intensity (or saturation). Again, there are tutorials explaining each colour property and also some examples on colour schemes. This is a very insightful chapter, especially for beginners learning to paint and mix colours. Chapter 4 has more advanced tutorials on simplifying complex shapes, layering shapes and creating hard and soft edges. And the last chapter talks about a few problems that students commonly face, and how to tackle them. The book actually covers both watercolour and acrylic, with the tutorials split among these two. Most of the explanation and concepts are not limited to any painting medium of course. 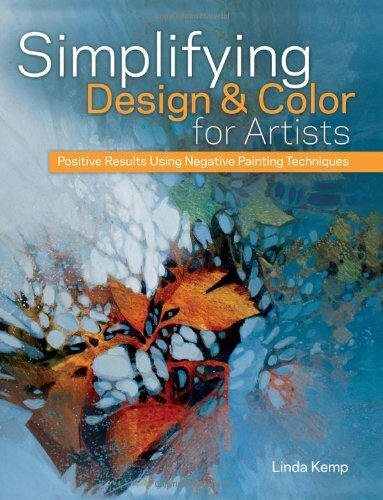 This is a really great book, rather hands on, and worth getting if you want to check out negative painting techniques, or to learn a new way to see things.